The review contains spoilers about Zom-B. The last time B Smith got up the world was still okay. There were reports about zombie attacks in Ireland, but who is possibly supposed to believe that? B had to learn the hard way that this attitude can have fatal consequences when zombies overrun the school the teenager attends. Book 1 was less about zombies and more about racism – in book 2, both topics are equally dealt with. As the zombies appeared rather publicly, you will not get away from them. But what is the matter with them? How come there even are zombies and how do they work? There are only some answers to those questions, and we also get a lot more questions that will probably take their time to be answered even partly. 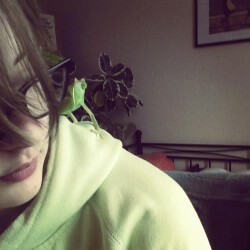 For example: not all zombies are brainless monsters. Some keep their consciousness and conscience, like the mutants that appeared in the first book and were able to control the undead. It gets clear that there is much more to come – especially trouble for B. Here, the racism concerns the so-called monsters. People’s first thought is to exterminate the zombies and to use some of them for experiments, whatever you like. Why should you feel sorry for them? They are monsters. Many forgot, though, that those have been normal people not long ago, who had a life and a family and friends. They might not be able to think clear now, but it is not their fault, is it? Of course, you cannot simply leave them be; they would start murdering others after all. However, Darren Shan shows us here that there cannot be drawn a clear line between good and evil. The book’s message is still that you cannot judge someone for what they are. For all that, the plot stays a little bit slow. We do not learn much more about the secrets even though there is much more information about the zombies. The book concentrates on the development of B’s character. In book 1 there was the fear that the father’s influence had become too much; now, B finally takes responsibility: for things past and present, even though in the latter case the teenager could not have possibly done anything to prevent it. Surprisingly, it is this short-haired rebel who appeals to the scientists’ conscience and who makes them aware that they are the ones acting like monsters. You do not really get to know any other characters. On the other hand, they do not appear long enough so it would be possible. The story is far from boring, though. “Zom-B Underground” does not have many pages anyway, but even so it is very entertaining. Give it an afternoon and you are finished. The author simply manages to throw us into an unknown situation and, when we gained some sense of orientation, to confront us with other mysteries and questions we instantly want an answer for. The result is a lot of fun while reading the book and the sudden urge to grab the next instalment – though I doubt we will know much more after reading the third book. It would be ridiculous if Darren Shan could not think of more to tease us. That man is anything but squeamish when it comes to his characters and readers. 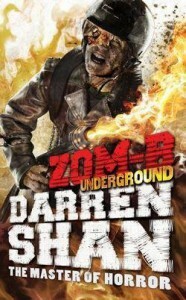 “Zom-B Underground” by Darren Shan is not perfect. There is not much development in the story and the only character you will find much depth in is B. Still, this book makes you craving for the next one. It is entertaining and fun without getting banal. There is no good and bad in those books – so if that is what you are looking for and you are still up for a good laugh, then the “Zom-B” series might be perfect for you!